With the start of the new year, most of us are focused on making changes and setting goals to help drive our success in the coming months. Often, we overlook potential changes for our business that could increase productivity. Your court reporting service is one of these areas that may need a change. Whether you are without a regular service or your current service is no longer meeting your needs, below are some things to consider when selecting a court reporter that best fits your business. In this digital age, it is easy to find multiple reviews of a business in a matter of minutes. It is important, however, to make sure that the testimonials for the business that you are contemplating hiring are sincere and accurate. Before simply selecting the business with the highest star rating, take some time to read through the testimonials. This can be very telling; if they are all short and unspecific vs. detailed and industry-related, you may want to look elsewhere, regardless of a high rating. This one may seem obvious, but you might be surprised to find out that your current service is not quite as competitive as you thought. Even if you are not looking to change services, it is wise to check around to see what rates and extra features some of the other companies are offering to make sure that you are getting the best package for your needs. For instance, your current service may charge extra for the use of a conference room, while a different service may offer this for free. It is always good practice to check the credentials of anyone that you do business with. Most states require court reporters to be licensed or certified but there are some states that do not, so it is wise to know the regulations where your depositions will be taking place. Additionally, if you will be presenting testimony that is highly technical or medical, you will want to choose a service that has reporters with specialized skills to handle this challenging testimony. Most court reporting services have a standard turnaround time from when your event took place to when you can expect to receive your transcript. Turnaround times can vary, so it is important to be aware of this upfront and also to discuss how emergency situations are handled. You want to make sure that the company you choose to work with will be able to cover the area that you will be working in. 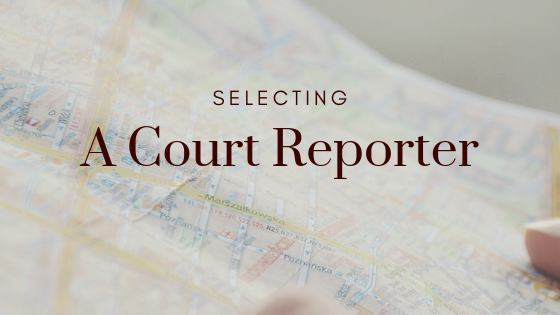 While not all court reporting agencies are national, they may have connections outside of their service area that can assist if the need for out of town coverage arises. It is always helpful to form relationships with companies that can help you in more than one area. Check to see if the prospective court reporting service can also assist you with things like legal videographers, interpreters or trial techs. Still on the fence about which court reporting service best meets your needs? We would love to schedule a time to talk with you about our service and how we can help you in the upcoming year! Veritext – Stenographer’s Friend or Foe? The Court Reporter — Dinosaur or Transformer? Copyright ©2014 MGR Reporting. All rights reserved.